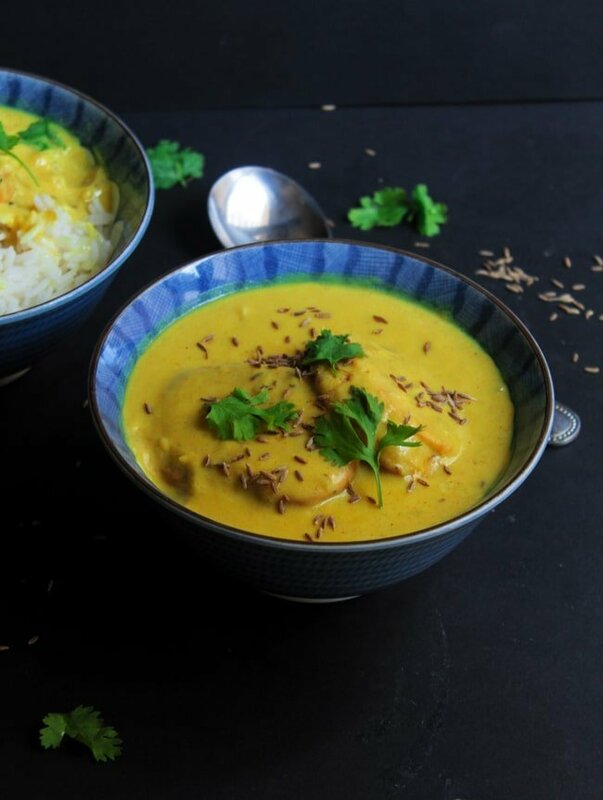 It’s time to celebrate fall, the Pakistani way – and that’s by making Pakistani Punjabi Kadhi Pakora! Okay, so fall isn’t here yet in Bahrain, because well, we really don’t get fall or winter here. Just pleasant mild weather in like December. But let me just pretend it’s fall alright? 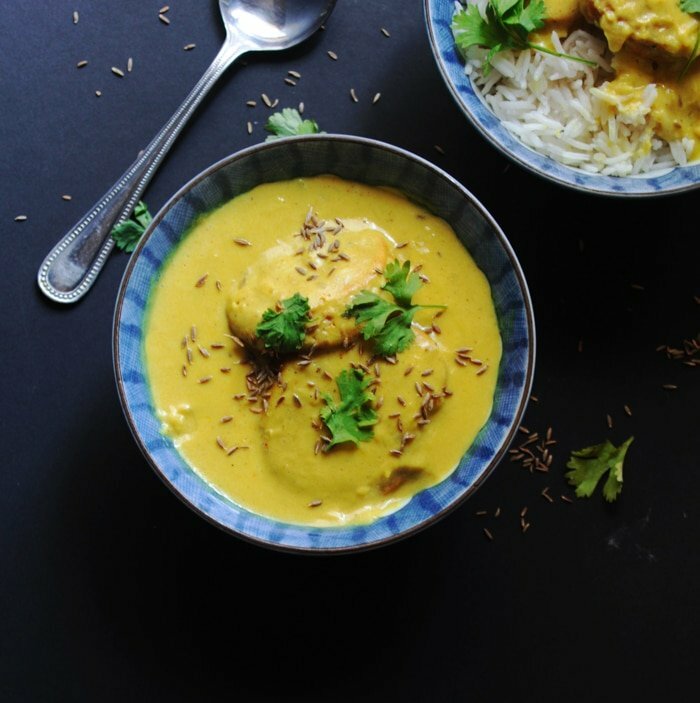 And if you’re a poor soul like me who lives in a place where summer never ends then you too can join me in my fall day dreaming, by making this Pakistani Punjabi Kadhi Pakora. So before the cooking begins, let’s dream a bit – close your eyes and pretend the leaves have turned into beautiful jewel like reds and golds. The wind is crisp and every evening has become a mandatory hot chocolate with marshmallows kind of an evening. It’s all about new beginnings, such as buying new sweaters and boots. Plus, you can indulge in all the comfort food you want because you need to keep yourself warm and cozy. That’s totally justified, right? I love fall. 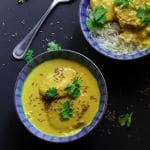 This Pakistani Punjabi Kadhi Pakora is one dish that I think is perfect for fall in Pakistan or anywhere else for that matter. That gorgeous yellow mustard color. Doesn’t it match with fall colors? It’s got a thick and tangy soupy base which is basically legit soul warming stuff. And then there’s the onion pakoras, all soft and succulent from the soupy base they’ve soaked up. Perfect fall food. Heaven in a bowl. The kind you can eat while watching Games of Thrones or The Big Bang Theory on a weekend. A gram flour and sour yogurt soupy/curry base. Don’t go away, the flavors work. I promise. Onion pakoray (fritters) that are cooked in said soupy base above. These pakoray sort of act as dumplings. And then there’s the tarka (tempering) which is basically where all the aromatics and spices come in play. This is an important part. It adds a lot of flavor. So don’t be tempted to skip it. I know the sound of a gram flour and sour yogurt soupy base sounds weird. But trust me, it really works in this case, with all the spices and cooking time, and the flavorful pakoray (fritters). I know it also sounds like a lot of work and time for just one dish. But all three components are very simple to make and the flavorful dish that you have in the end makes up for all the time. Serve this with steaming white or chappati with a side of salad. Onion pakoras (fritters) cooked in a tangy and creamy yogurt curry. Place all of the karhi yogurt base ingredients into a blender and blend until fully incorporated and smooth. Set aside while preparing the other components of the dish. In a medium sized bowl, mix together all of the ingredients for the onion pakoras (fritters). The onion gram flour batter should thick. It should have a paste like consistency. Heat oil in non-stick fry pan. Using a tablespoon drop the batter into the oil and fry until golden brown. When all the pakoras are fried, set them aside on a paper towel to absorb the excess oil. In a large pot, heat the oil and and add the cumin seeds and fenugreek seeds and fry on low heat until the spices release their flavors. Add the chopped onion and fry on low heat until pale and translucent. Then add the ginger garlic paste and green chilies. Saute for a minute or two. Now add the curry leaves and the dry red chilies and fry for another minute. Add the karhi yogurt base now (which we blended in the blender earlier). Stir very well. Increase the heat and let the karhi yogurt base come to a boil. Lower the flame once it comes to a boil and simmer for about 30 minutes. Keep stirring every few minutes. Add water as needed if the karhi becomes too thick. Add the onion pakoras (fritters) and cook on low flame for another 15 minutes. Finally add the garam masala powder on top of the karhi. Serve the karhi pakora with white rice or fresh chappatis. 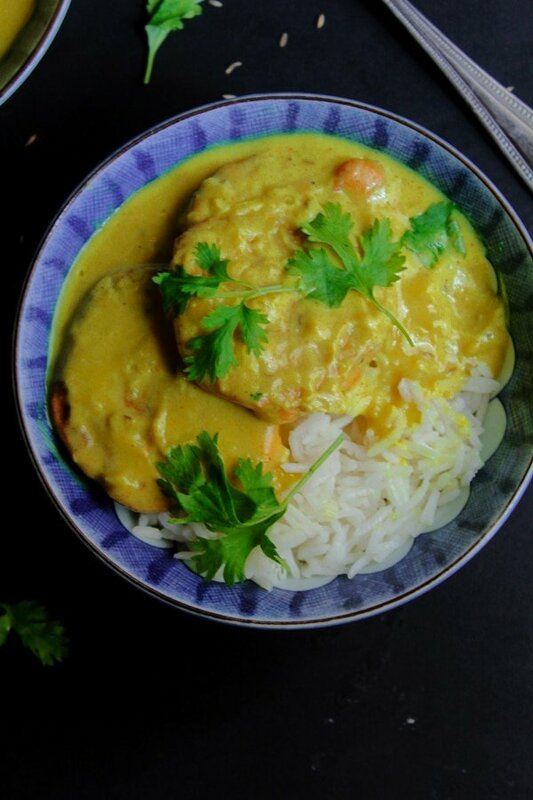 I love curries and I need more recipes to follow. I have never seen a curry on top of onion fritters. I am sure this has great texture and flavor. Just one concern, after putting in the pakodas the curry became too thick. What can i do to avoid that the next time?